Sweet almond oil, grapeseed oil, Hawaiian Kukui nut oil, calendula oil, chamomile essential oil, tropical passion fruit oil. A: Roman Chamomile Essential oil from Aviano Botanicals. Q: With the other fragrances added do they over take the aroma of the Chamomile? A: The fragrances blend together, you can smell hints of both, chamomile and the sweetness of passion fruit. 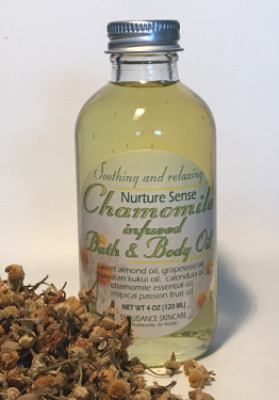 Should I mention that besides the chamomile essential oil added, the oil blend has been infused with chamomile flower buds for 3 weeks under the sun and then strained, which further gives the skin skin soothing properties to the body oil. Hope this helps.